Posted on Monday, February 28th, 2011 at 12:29 pm by Renat Tlebaldziyeu. Part 7 of the deployment series explains how you can use your favorite installer software to deploy your Office extensions over the web; this is the essence of ClickTwice :). If you didn't read the previous parts of the series, I’d advise that you start with Part 1 – a brief overview of the available deployment technologies. 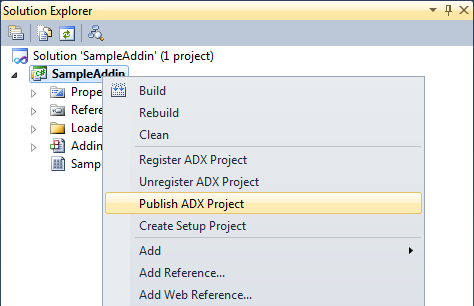 Select your project in the Solution Explorer window and choose Publish ADX Project in the project context menu (you can also find the same item in the Project menu of Visual Studio). 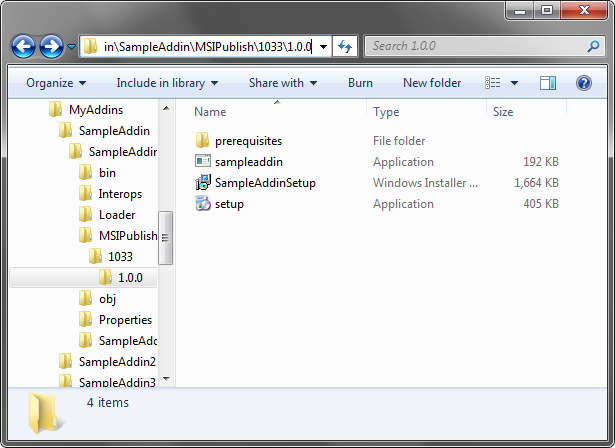 Specify the path to the .MSI installer in the Installer file field. 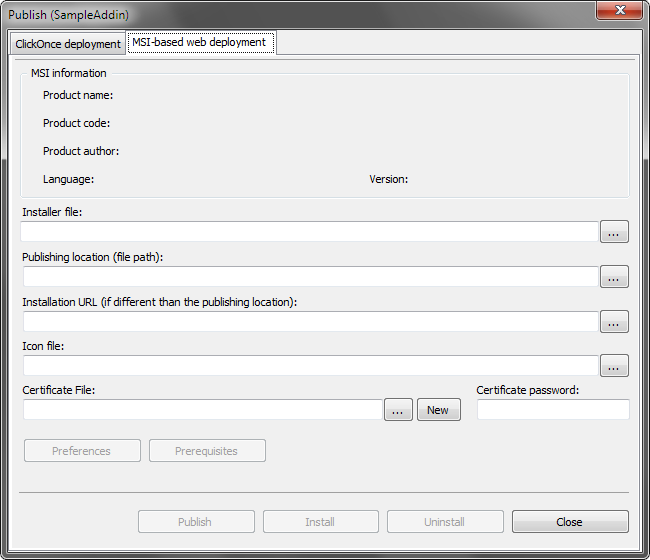 The Publish wizard reads some general info about the .MSI and fills in the fields in the upper part of the dialog. Note! Using an http server as a publishing location is not supported. You can use the Installation URL field to specify a location from which users will download the Office extension installer. 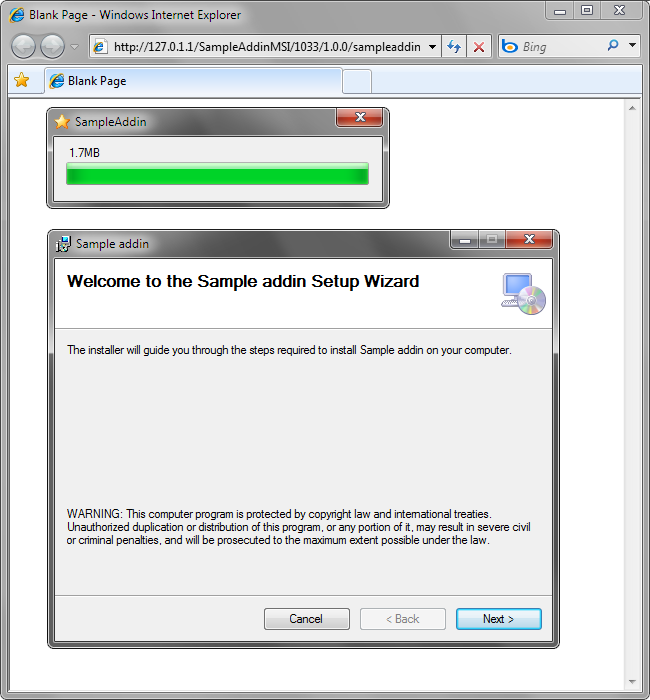 In the Installation URLedit box, enter the installation location using either a fully qualified URL in the format http://www.domain.com/<ApplicationName>, or a UNC path using the format \\<server>\<ApplicationName>. You can specify an icon in the Icon file field. The icon will be shown in the downloader window, which is displayed when the installer is downloaded from the installation location (see Step 12 for example). Browse for the existing certificate file (.pfx or .p12) or click New to create a new one. Enter the password of the certificate (optional). To hide the Windows installer UI during installation or uninstallation, you can check the appropriate option(s) in the Preferences dialog. You can also specify a web page that provides users with additional information about available updates or some other information about your product in the Download page for updates field. 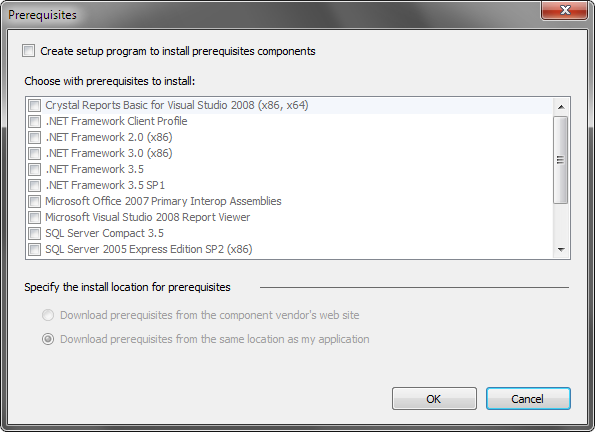 Click the Prerequisites button and select any prerequisites in the dialog window. 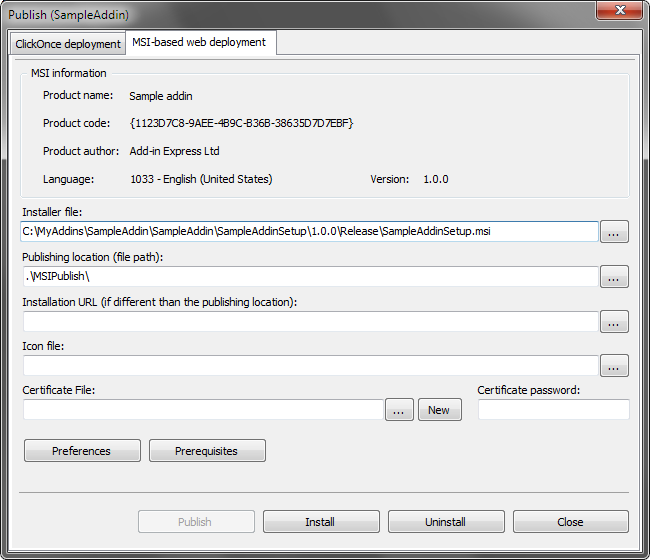 Add-in Express generates a setup.exe to install the specified prerequisites. When the user runs the setup.exe, it installs the prerequisites and invokes the Add-in Express downloader program to install/update your Office extension (see Step 12 for example). When you click the Publish button, the wizard creates all necessary files and folders in the location specified in the Publishing location field. Let’s dwell on the files and folders. All versions of your Office extension are stored in folders, which are named according to the formula <language code>\<version number of the .MSI installer>. For instance, version 1.0.0 of the sample add-in created for this article is stored in folder 1033\1.0.0, where 1033 stands for the locale English-United States. Upload the files and folders from the Publishing location folder to the location you specified in the Installation URL field. The user clicks the link or navigates to it with either an Internet browser or Windows Explorer. 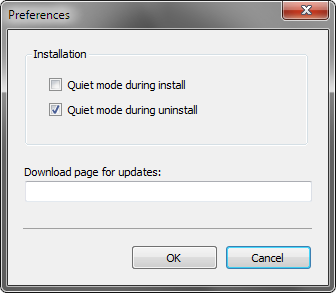 To uninstall your product, the user goes to Control Panel – Programs and Features. Please see Redeploying Office extensions via ClickTwice. I have has a lot of trouble with the downloader (app.exe) first it’s not clear that the Version_info.xml file should be in the directory on the web server that is pointer to by the install_url. if not there will be a error 404 and a messagebox that can’t be debuged. Now the installer woeks on WIN7 but not on XP-SP3! an error box “parameter not valid” is shown but no information on which parameter or why? How can this be debugged? First of all, please pay attention to step 11. 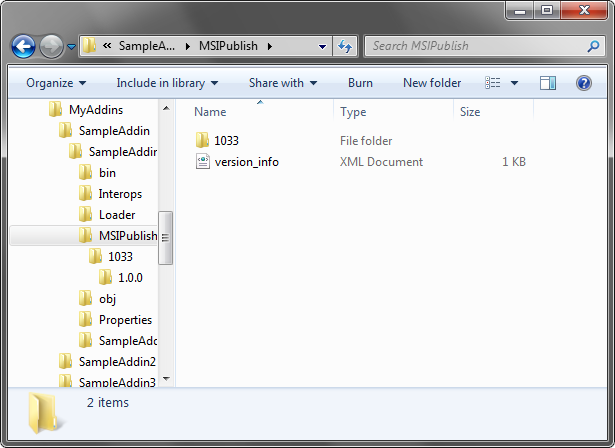 As you can see the version_info.xml file is generated in the location that you specified in the Publishing location (file path) field. So you should copy this file and all other files to the location you specified in the Installation URL field. >>no information on which parameter or why? How can this be debugged? I’m sorry, this cannot be debugged. We will consider adding more details to the text of this error message in the next public build of Add-in Express .NET. Thank you for your suggestion. What’s the best practice? Adding a link for download/addin/addin-loader.exe pointing to the most recent version of the actual loader file? I don’t understand your point. Do you expect that the same downloader will be used whatever update is installed? If so, this isn’t possible. Every downloader is version-specific: to download any given update a a specific downloader is used.